On behalf of Herbert Hoover, Lewis Strauss tells Joseph Tumulty that he will be unable to accept the invitation to speak from the Lotos Club of New York. 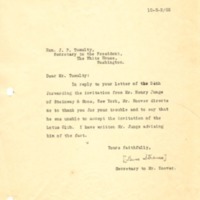 In reply to your letter of t;he 24th forwarding the invitation from Mr. Henry Junge of Steinway & Sons, New York, Mr. Hoover directs me to thank you for your trouble and to say that he was unable to accept the invitation of the Lotus Club. I have written to Mr. Junge advising him of the fact. Strauss, Lewis L., “Lewis L. Strauss to Joseph P. Tumulty,” 1917 October 27, WWP19237, Hoover Institute at Stanford University Collection, Woodrow Wilson Presidential Library & Museum, Staunton, Virginia.